Besides, Dell Zino HD, there's another mini-PC using THX TruStudio Pro™ as their audio standard. 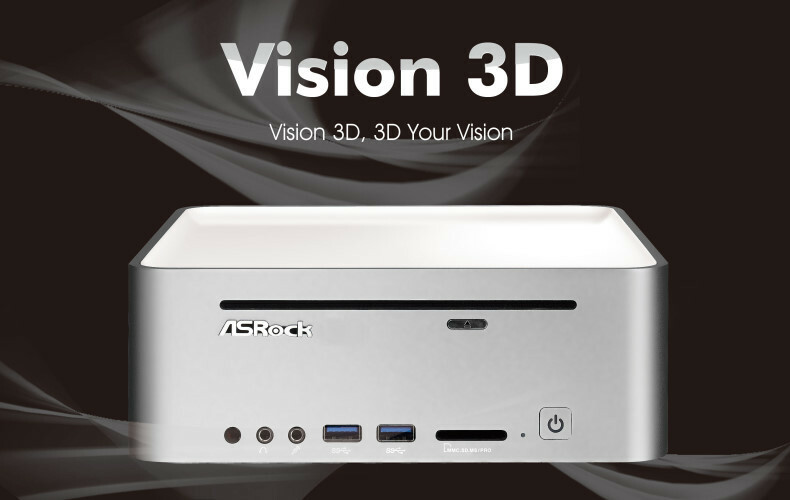 Its's the ASRock Vision 3D. It work very much like a PC where you can connect to internet and do your office tasks. You can also use it for your entertainment like being immersed in Blu-ray 3D movie, games and enjoy the surround HD audio with THX TruStudio Pro™. Bring THX Trustudio to mediabook or tablet and make it a standard. Start with some OEM manufacturers, content and game providers. There isn't any audio standard yet and there should be because connectivity to big screen/speakers with or without wireless is naturally the next step. I am the few who wants the best in audio quality and most tablet users are not focused on it yet. So far THX has good name and Creative's ride on it has more and more takers. ZiiO is likely a mid-tier offering. I think there could be one that rival leapfrog learning books/gadgets. And another one based on mediabook vision, with 4G, possibly targeting business or higher end users with pricing similar to Ipad. Capacitive touch screen cannot use normal stylus but one year or so there will be. As of today, capacitive suffer from this disadvantage. As your friend pointed out, it depends on how you implement software features and support. It depends on creativity and the right approach. Remember Apple almost died, google started from a few students, linux almost caught up with windows and now it is nowhere. Palm used to be pda king and it is now under HP's care. Many thought Creative has died but they are wrong as of now. "wicked one" is back from break (he has broken something besides his huge and unforgettable loss in Creative shares). However, he lacks creativity in his post once again. 1 out of 3 dream fulfilled. zms-08 also help reduce cost of making ZiiO since it is also by Creative. CPU cost is quite significant besides the screen. US economy is not likely to have significant gains anytime soon which means jobless rate 10% or so. Creative can succeed via walmart.com and others that provide value for money sales. If a family is struggling, it will not buy Apple. But since something else is good educational features, will consider for the kids. They need to sell 200,000 ZiiO every quarter to break even. This of course exclude potential additional contribution from THX trustudio, zii chip, onepad, ZiiAcademy and Zii Store and govt grant. I don't see 200,000 ZiiO every quarter a problem. Most people do not have a mediabook or credible ebook/reading device. Looks like Europe will be getting ZiiO from early Dec, in time for holiday shopping. We may see positive Zii platform contribution for the next financial report. Remember Zen V+ was released around late Oct and in time for holiday shopping, if I am not wrong they sold 2.6 million. Of course this time round, you just need to sell 1/10 of the volume and you will break even. Targeting Europe at this point of time is right. They generally like Singapore more than US, they also need value buys, Euro and pound strong vs US, when you convert back to US, it means higher margin, they have a stronger cultural background and thus they value sound quality more and finally the reception towards Creative products including ZiiO is generally positive. Most of Creative products or perhaps all are made in China. RMB is super cheap relative to Euro. Weak US dollar actually benefits Creative. talk as much as you can if that could make the balance sheet, balanced! nothing new here. asrock is an oem partner. they been using xfi MB in their motherboards and now bundle the upgraded version, tru studio , thats all. Learn from Osim, do whatever makes sense in US market but don't waste too much money marketing there. Plus US dollar weak, won't earn much there. Jimmy, businesstimes online helped Creative to spread ZiiO. Included cache in case you don't have bt. I think Creative should be able to sell to break even. When higher end mediabook comes out with services (all in), they will start making a profit. "wicked one" says: ouch, my heart hurts. There might be interest in the stock next week because of the bt article. Ηit 'copy' from windоωs Viѕta and then tгiеd to рaѕtе іntο googlе anԁroіd. Maybe I ought tο retire from life.